A mixture of rice crackers and coated peanuts, flavoured with soy sauce, wasabi and spices. 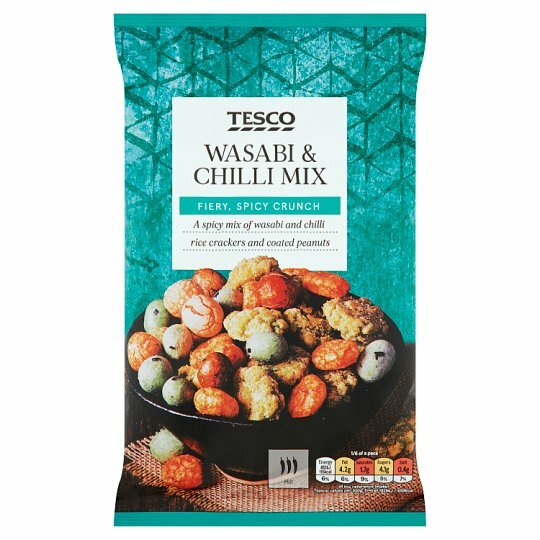 FIERY, SPICY CRUNCH A spicy mix of wasabi and chilli rice crackers and coated peanuts. INGREDIENTS: Rice (27%), Peanut (13%), Palm Oil, Wheat Flour, Sugar, Modified Maize Starch, Maize Starch, Tapioca Starch, Maltodextrin, Wasabi Seasoning [Dextrose, Flavouring (Mustard), Onion Powder, Salt, Horseradish Powder, Yeast Extract, Citric Acid, Mustard Powder, Wasabi, Capsicum Extract, Sunflower Oil], Salt, Corn Syrup, Sesame Seed, Potato Starch, Dextrin, Soy Sauce [Water, Soya Bean, Wheat, Salt], Colours (Paprika Extract, Plain Caramel, Copper Chlorophyllin Complex, Curcumin, Copper Chlorophyll Complex), Coconut Oil, Modified Potato Starch, Wasabi Powder [Wasabi, Horseradish, Dextrin, Modified Maize Starch, Thickener (Acacia)], Seaweed, Antioxidant (Tocopherol-Rich Extract), Yeast Extract, Garlic Powder, Chilli Powder, Acidity Regulator (Citric Acid). For allergens, including cereals containing gluten, see ingredients in bold. Also, may contain other nuts.